StockWatch is a stock tracking and portfolio management app available in two different but very similar versions, one for the iPad and the other for your iPhone and iPod touch. While both applications sport virtually identical sets of features, they provide you with access to same information in very different ways, due largely to the screen size limitations of the smaller iOS devices. Still, regardless of what version you use, Toughturtle’s financial apps prove very useful. StockWatch breaks your stock information into two distinct areas—stocks you’re watching to see if you want to buy them and portfolios of stocks that you already own. The Watchlist displays a user-customized list of as many stocks as you want to keep track of. Of the two apps, I found the iPad version to be more difficult to find and add stocks with, largely due to the fact that the iPad app didn’t seem to remember how I last searched for a stock. StockWatch—iPad Edition also adds an extra variable for exact and partial name searches, which tended to hurt rather than help my searches. 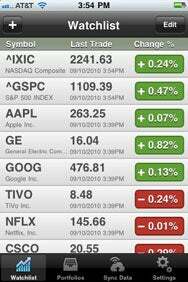 Once you find the stock you want to watch, tapping it once adds that stock to your Watchlist, where you can keep track of how it’s doing. Market Minder: StockWatch helps you keep detailed track of stocks you hope to buy and the value of all the stocks you already own. From within your Watchlist, tapping a stock once displays detailed information about that its market activity, including the current day’s price range, the current ask and bid prices, a variety of charts, and news articles specifically about the company you’re watching or related news about similar companies or market sectors that affect your target. It’s here that the iPad version of StockWatch has a distinct advantage over the iPhone/iPod touch version. On the iPad, this information is available all in one view. To see the same information on my iPhone, I had to tap, scroll, and often tap again. StockWatch’s Portfolio view is, to my mind, one of the app’s best features. Using this tool, you can manage an unlimited number of stock portfolios each of which can contain an unlimited number of stocks; what’s more, each of the stocks you’re tracking in a portfolio can have an unlimited number of purchase lots. What this means is that you can track every single stock purchase that you make, including any associated fees, and StockWatch will keep track of the value of every individual purchase you’ve made. StockWatch will then pull all this information together and display the value of all the portfolios you’re watching and provide detailed information for the portfolio you’re currently looking at. Drilling for Data: Because of its smaller screen size, the iPhone version of StockWatch requires you to drill a little deeper to get the information you want, but it’s still a very good stock tracker. As much as I like StockWatch just the way it is, there are definitely a couple of features that I’d like to see added. 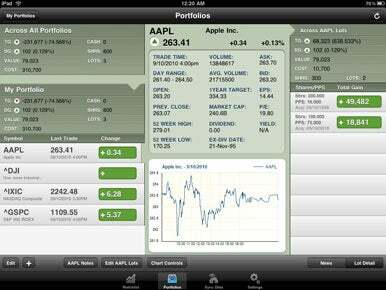 First, when running on iOS 4, I’d love to be able to set high and low price points for stocks so that StockWatch, while running in the background, could notify me when a stock has reached a point where I’d want to buy or sell it. Second, it would be great if there were some way to e-mail myself a portfolio report containing the financial information StockWatch tracks for each of my portfolios. StockWatch is an excellent stock tracking application, whether you’re using an iPhone or an iPad. While each version offers a distinctly different user experience because of the size of the devices, the way that StockWatch tracks and manages information is unparalleled on your iOS device.